They’re largely harmless, but might give you a startle if they glide by while you’re taking a swim. Butterfly rays, found all around the world’s oceans, have shown up in New Jersey waters over the past couple of weeks, sparking conversations on local beaches about giant creatures in the surf. People haven’t been seeing things: butterfly rays can reach 7-feet (or more) in width, but are considered gentle giants. 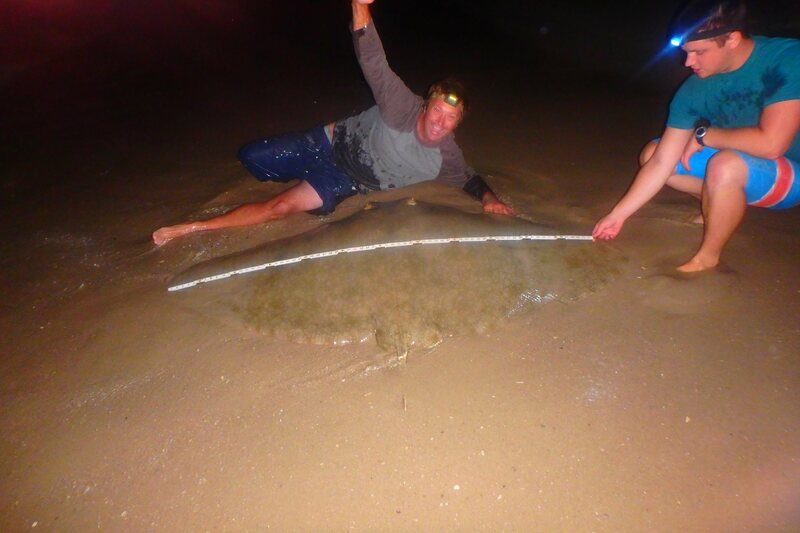 Nick Honachefsky, a well-known local angler from Normandy Beach, hooked a butterfly ray as large as him Sunday night and posed for a picture to prove it. Honachefsky, in a social media post, said the fish – caught in Lavallette near President Avenue – weighed as much as 150-pounds. “He was released immediately after the hook [was taken] out,” Honachefsky said. Butterfly rays are considered harmless to humans, except if a person were to step on the tail of the spiny variety. They are caught for food in many parts of the world, but are never targeted by fishermen in the United States. Those that are caught, like Honachefsky’s, are thrown back immediately – save the time to snap a photo. The species is considered relatively rare over a wide area, though many can congregate in a smaller locale once they find a location that suits them. The extremes of their range stretch from Massachusetts to Buenos Aires, Argentina, and off the European Atlantic coast as well as in the Mediterranean Sea. They are often found spawning in tidal creeks in Virginia, but occasionally make it up to New Jersey waters.